Black and Decker Cordless Combo Kits - Household Drilling Made Easy! Are you thinking of a powerful cordless combo kits to address issues of everyday household needs? You find the perfect match with Black and Decker Cordless Combo Kits. It is quite versatile for not only can it be used on wood, it could be used for pruning plastic and metal too. Let us analyze the Black and Decker Cordless Combo Kits with 5 tools - the 18 Volt Ni-Cad cordless tools. This amazing product comes with 5 important power tools namely the Drill & Driver, Handsaw, Sander, Stud finder, Flashlight. The Drill has a useful detachable chuck. The transition from a Drill to Driver hence is an effortless task because of the driving bits. There are six more bits that one could store. Once the chuck is detached, we could use it for screw-driving the bits. The hand saw is popular and reminds us of good old years in the simplicity aspect but it is found to be excellent in power. This electric hand saw has a higher torque facilitating easy cutting. May it be the wall board, or plastic item or any metal, it works smoothly. Probably the pick among the lot is the Sander. The Sander is one power tool offered by no other manufacturer and is a welcome member of this combo kits, thanks to its versatility. Sander is highly efficient to smoothen wood and wood finishes. Sanders have sandpaper attached and the working methodology enables them to move swiftly. The Sander present here combines the work of three different sanders - the random orbiter, detail and finish sanders. The Detail orbiter moves with a triangle shaped piece of sand paper and is helpful for corners and tight places. The Random orbit sander spins and at the same time moves in an ellipse leaving no part left out. The advantage of this sander is the fact that it doesn't leave any marks. Random orbit sander works well for pieces of wood working in right angles. They have dust collectors too to cleanse. The fourth tool in this Black and Decker combo kits is the Stud finder. Stud finder in this kit has a stud sensor which helps in locating studs up to ¾ inch and hence is your best comrade to hang your shelves, wall hangings, household paintings, fixing your coat hooks. The flashlight is so powerful that it can be used to amble even in the dark at home apart from the regular use of finding the studs in dark. The batteries provided (though 2) are not that powerful all the time. It is well supported by a rugged bag with copious space to fit all things. The Black and Decker Cordless Combo Kits also comes with 4 tool kit without the sander and replacement in the saw is the circular and reciprocating saw. While the former helps with faster cutting the latter cuts wood, metal and plastic. These cordless combo kits are devoid of variety and concentrate more on residential front in their application. 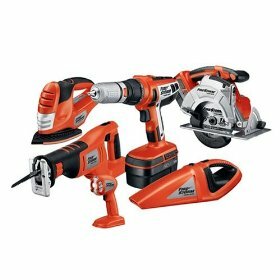 Return From Black and Decker Cordless Combo Kits Page to Home - Finishcarpentryhelp.com.